The dial depth gauge is intended for metering depth of slots, holes and sholder height of up to 100 mm. 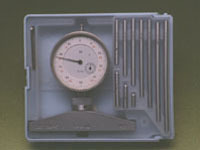 The depth gauge is provided with the dial. The range of measurement is ensured by the set of changeable standards with a deposited hard surface.